As autumn approaches, the in-season produce changes from zucchini and corn to vegetables like butternut squash and pumpkin. Unfortunately in Florida, the end of September sees temperatures in the high 80's and low 90's. 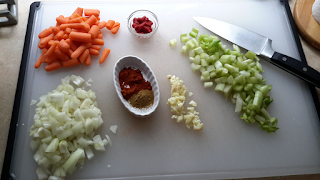 In hope of bringing the cooler temperatures here a little quicker, I created this soup recipe. The bacon, paprika, chipotle, and cumin add smoky flavors that offset the sweetness of the pumpkin. While you definitely could cube the chicken and cook it in the soup, I like the texture better with shredded chicken. You can use shredded rotisserie chicken breast, or cook the chicken and shred it, which is what I did. In a Dutch oven or other large pot, cook the bacon over medium low heat until the bacon is crisp and the fat renders. Drain the bacon on a paper towel lined plate and reserve 1 tablespoon of bacon drippings. Add the reserved bacon drippings and 1 tablespoon of vegetable oil to the pan. Add the carrots, onions, and celery and saute for 8 minutes over medium heat, stirring occasionally. Add the garlic, tomato paste, paprika, and cumin. Cook for two minutes. Mix in the pumpkin and cook for 5 minutes. Whisk in the chicken broth, bring to a simmer and cook for 30 minutes. Puree until smooth with a hand blender. Add chicken and cook over low heat for 10 minutes. Serve, sprinkled with chopped parsley and bacon.